Clinical Oncology brings you a combination of high-quality original research, informative editorials and state-of-the-art reviews on all aspects of the clinical management of cancer patients and also key pre-clinical and translational oncology research. With the increasing time pressure on clinicians, we work hard to make it as easy as possible for our Fellows and members to access the latest research in the journal with podcasts about high-profile articles and an app so that you can stay up to date wherever you are and save your favourite articles and access content offline. 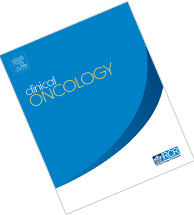 As a Fellow or member of the RCR you are entitled to receive a paper copy of Clinical Oncology each month, but if you prefer to access content online only, log in to MyRCR and update your preferences. You will also find a link to the journal in the top left panel of the MyRCR page in the box labelled Quick links. Accessing all Elsevier-published medical journals from one area named ‘More periodicals’. Alongside publishing high-quality original research, reviews and editorials, Clinical Oncology is also intended to be an educational resource for our Fellows and members. In 2015 we launched Science in Focus – a series of editorials from leaders in their field providing succinct updates on areas of progress in scientific understanding and how these impact on the oncology community. Read the series so far to find out about new developments or refresh your knowledge in an area you’ve not reviewed in a while. Are you involved in a research project? We know that many of our Fellows and members are actively involved in research. Elsevier, our journal publishers, provide a range of resources to assist throughout your project. Visit the Publishing campus to view lectures and courses on the research process and how to make sure your paper gets noticed. In addition, the Author hub provides a wealth of information for anyone who is looking to publish research. Clinical Oncology is the journal of your Faculty and we encourage Fellows and members involved in research to submit to the journal. Our fast turnaround time means that your article could go from acceptance to published online (not paginated but in the public domain and citable using DOI) in an average of four weeks. Manuscripts submitted for publication will be subject to peer review. Some manuscripts may be published online only. Not a researcher but still want to get involved? We are always keen to welcome new reviewers to join the Clinical Oncology team. Find out more about what this entails on the Elsevier website and apply to review for Clinical Oncology by sending your CV and a list of your specialties to Editorial Office (clinonc@editorialoffice.co.uk). SciResearch, ISI Alerting Services, Current Contents, Clinical Medicine, EMBASE, Excerpta Medica, Index Medicus. You can now make your next accepted article in Clinical Oncology open access by simply selecting this option after your acceptance notification. For more details see the guide for authors.